First Lady Michelle Obama not only met Queen Elizabeth II, but also Kate Middleton, now known as Catherine, Duchess of Cambridge, Tuesday afternoon at Buckingham Palace in London, England. 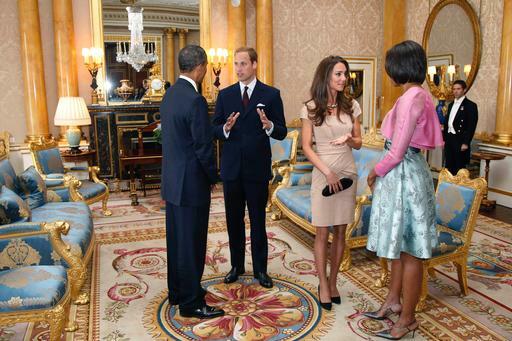 President Obama and the first lady are in the UK for a two day State Visit at the invitation of the queen. For this special occasion, Mrs. Obama wore a mint hued floral dress, which appeared in designer Barbara Tfank’s Resort 2011 collection. The A-line skirt with its defined, high waist flattered Michelle’s lovely pear shape. She layered this dress with a pale pink, cropped cardigan adorned with her signature jeweled brooch. As for Catherine, the duchess wore a Shola Bandage Dress for this first royal appointment, post honeymoon. The beige dress with square neckline and angular cap sleeves is by one of her favorite designers, Reiss. During their State Visit, the first couple will be attending a state banquet at Buckingham Palace and the president will address both houses of parliament at Westminster Hall. Whose ensemble do you like best? Three days until the Royal Wedding, and the secrets keep unraveling! 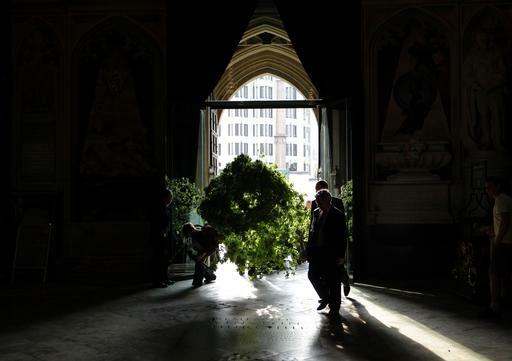 Westminster Abbey will be blanketed in seasonal British flowers and foliage for the royal wedding this Friday. Trees, six English Field Maples and two Hornbeams, will line both sides of the aisle which leads to the altar, while Azaleas, lilacs and wisteria will be spread throughout the abbey. So what do these flowers symbolize? Much of the greenery will come straight from the royal estate; it was reported that Prince William spoke to the Queen, who was delighted to supply the plants. The majority of the flowers will come from Windsor Great Park. Assisting Connolly with the flower décor is Emma Sampson, the Middleton family’s florist. 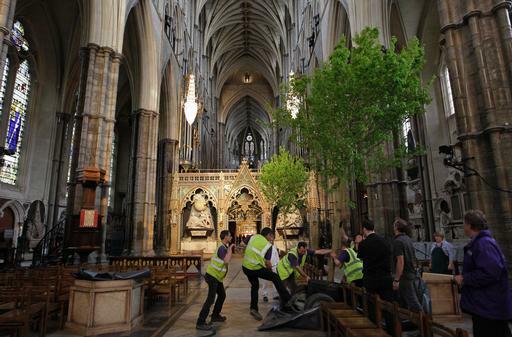 After the wedding, the flowers will remain in Westminster Abbey for the public to view until May 6. 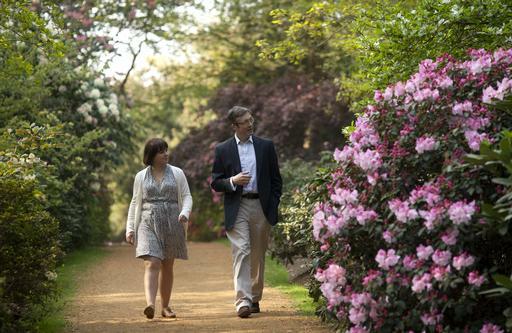 At that time, Prince William and Kate have asked that the flowers be removed and donated to charity or replanted. Although the flowers planned for the decorations have been revealed, it still remains a secret as to what flowers the bride has chosen for her bouquet. Perhaps, she will stay with traditional white flowers …what are your predictions? From the dress to the guest list, we’ve got it all! Wedding Gown – Who designed the dress? Details regarding Kate Middleton’s wedding gown have been kept a secret, as she has vowed not to reveal any details until she is seen at the ceremony. However, London’s Daily Mail reported some details of the design early Monday morning. The fashion savvy Kate Middleton will wear a dress which she designed herself! The design is rumored to be reminiscent of the Renaissance period, taking inspiration from Middleton’s History of Art degree. It has been reported that the bride has designed an ivory gown with satin and lace detail, a pearl button back and 10-foot train. The dress will also include what is described as a “nod” to the Emanuel wedding gown worn by Princess Diana. 34-year-old designer Sophie Cranston, of the low-key label Libelula, was tipped as the creator of Middleton’s dream design. Guest List – What celebrities will be there? The royal family has just released the invite list with some expected, and some rather surprising, names. President Obama and First Lady Michelle did not make the cut of 1,900 lucky guests. Of the 1,900 guests, only 600 have been invited to the lunchtime reception at Buckingham Palace given by Queen Elizabeth. Furthermore, only 300 have been invited to the dinner at Buckingham Palace given by Prince Charles. The list totals 1,000 friends and family members, 52 members of the royal family, 46 members of foreign royal families and 80 guests from Prince William’s charities. Sir Elton John: A favorite of the royal family and memorable performer of “Candle in the Wind” at the funeral of Princess Diana. David and Victoria Beckham: As president of the U.K.’s Football Association, Prince William has become close friends with the Beckhams. 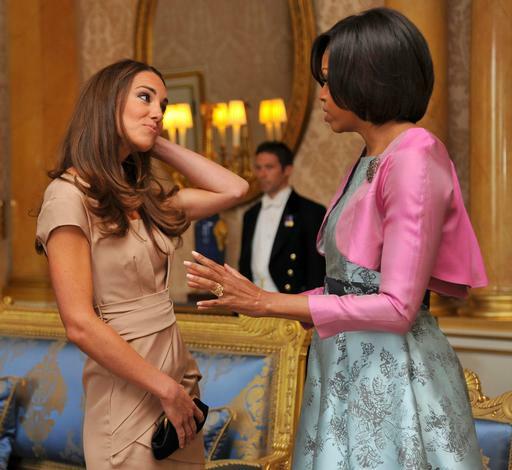 Additionally, Victoria Beckham, the former Posh Spice, is one of Kate Middleton’s favorite designers. Rowan “Mr. Bean” Atkinson: The actor is a close friend of Prince Charles. Perhaps if things start dragging at the ceremony, Mr. Bean can lighten the mood. Guy Ritchie: The film maker and former spouse of Madonna is a friend of Prince William and Kate. Joss Stone: This soul-singer is a longtime friend of William and Harry, and even performed at the 2007 Concert for Diana and 2008 City Salute. It is also rumored that Kanye West has received an invitation. The royal wedding will take place April 29 at Westminster Abbey. Check back for more royal wedding updates! And if you live for fashion and politics, check out my articles on First Lady Style at FashionablyCorrect.com. White – it’s the latest rage! The time has come to put away that black dress of the holiday season and pull out this spring’s hottest trend, the little white dress. Kate Middleton, the fiancé of Prince William, first brought our attention to this chic trend by wearing the white, Nannette dress, designed by Reiss, for her engagement photos. Since these pictures were released in mid-December, designers, as well as department stores, have been unable to keep their white dresses in stock. However, a new shipment of the Reiss Nanette dress, the exact design Kate Middleton owns, will be delivered to the States this Monday, February 7. The dress will be available for only $325. Check out the Reiss blog here for more details. Think $325 is too expensive for this look? Don’t let the price stop you from getting this fresh, spring must-have! Check out these other sites for that perfect little white dress of the spring 2011 – J.Crew, Dillards. Don’t forget to get the look best for your body type (check out this article for more details).